Prime Minister Narendra Modi today adopted a village in his Varanasi parliamentary constituency and exhorted its residents to combine their collective strength to educate children and ensure hygiene. The Jammu and Kashmir Awami National Conference today pleaded with the Supreme Court to direct the Election Commission to defer the Jammu and Kashmir Assembly elections, slated to be held in five phases from November 25 to December 20, till the situation became normal in the flood-ravaged state. Kashmir Centre for Social and Development Studies (KCSDS), a non-government organization, today urged the Centre to defer polls till return of normalcy to the state. Budget passenger carrier SpiceJet today said it has suspended its services to Surat indefinitely after one of its aircraft hit a stray animal at the city’s airport last night. The Supreme Court today set aside a Madras High Court judgment directing the government in 2010 to include caste details of the population in the Census. A three-member Bench headed by Justice Dipak Misra noted that the government had the power to decide the method of Census and the details that had to be collected as part of it. There are only 1200 trained neurologists available for a population of over 1.27 billion in India. This, according to neurologists from the UK, the US and Indian doctors practicing abroad, is a highly imbalanced ratio when compared to the figures in their respective countries. Unfazed by denial of the Leader of Opposition status in the Lok Sabha, the Congress has formed several shadow Cabinet committees along with Twitter handles as part of move to be an effective Opposition. The Indian Navy today ordered a Board of Inquiry into the sinking of a Torpedo Recovery Vessel (TRV) off Visakhapatnam coast on Thursday night in which a sailor died and four others are still missing. The Supreme Court today directed the Centre to provide details about the number of government bungalows meant for ministers and MPs and how many of the occupants were overstaying despite demitting office or completing their tenure. Contending that terror is a global menace, Israeli Prime Minister Benjamin Netanyahu and Home Minister Rajnath Singh here have reviewed existing cooperation and future possibilities of enhancing engagement in dealing with the threat. The West Bengal Police last night arrested Asif Khan, former editor of Urdu daily Kolam (pen) and once a close aide of Chief Minister Mamata Banerjee, from the Tiljala area in connection with the Saradha scam. He is a member of the TMC Minority Cell and has been involved in development works related to minorities supporting the TMC. Nobel Prize winner and former President of Israel Shimon Peres today lauded Prime Minister Narendra Modi saying he is paving the “third revolution” in India by combining tradition with the right technology to take the country to new heights. In a move that will allow for the establishment of formal mechanisms to approve new systems of medicine for use in India, the government is working on a Bill for introduction in the winter session of Parliament. With Prime Minister Narendra Modi scheduled to travel to Australia to attend the G-20 Summit next week, his Australian counterpart Tony Abbott called him up today to discuss the agenda for the multilateral meeting suggesting that Modi shares his visit to speed up global economic growth and employment generation. The Congress may not take action against Karti Chidambaram, son of former Finance Minister P Chidambaram, who attacked the centralised functioning of the party. 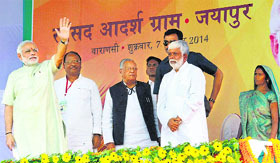 Modi, who is on a two-day visit to Varanasi, was accorded a grand welcome at Jayapur village. Village women garlanded him and put a vermillion tika on his forehead. After a brief interaction with village elders and village head Durga Devi, Modi addressed the enthusiastic gathering, seeking their support in developing the village. Trashing media reports on the criteria for selecting Jayapur village, the PM said the village drew his attention when he came to know that five people had died in a fire here. “Jo sankat ke samay sambandh bante hain wo rishte chiranjeev hote hain” (The bonds forged during testing times are everlasting),” Modi said. He said while the villagers might be expecting grand announcements from him for the village, he would choose not to make them public but rather focus on work. 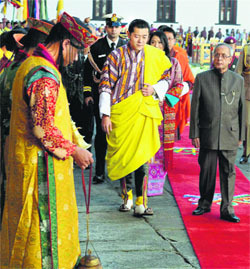 He also sought people’s support in ushering in the change. “I do not talk big, I was not born like that. I say small things and do big things,” he said, pointing out that if only tall pronouncements by earlier governments had borne fruit, this village would not have been such a poor state as it was now. Modi told villagers that they should combine their collective strength and put it to good use such as educating children, ensuring hygiene and making cleanliness a family priority, and celebrating the birth of a girl child. Saying that today in fact the village was adopting him as a parliamentarian and not vice versa, Modi said time had come when the people should realise their strength and rather than merely waiting for government help, should come forward to improve their lot. Jayapur is a typical Uttar Pradesh village with a population of nearly 4,200. The population has a mix of Brahmins Musahar, Yadavs, Patels, Bhumihars, Bania, Kumhar and Dalits. There is only one primary school in the village and the lone intermediate college is about 10 km away. Incidentally, the village has no Muslims. Wants tech upgrade in textile sector The PM laid the foundation stone of a trade facilitation centre and crafts museum and inaugurated a power loom service centre. He favoured “technological upgrade” and “human resource development” in the textile sector so that the youth took to it as a vocation “not out of any compulsion”. 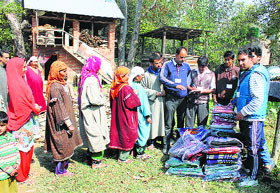 A file photo of volunteers distributing relief material among flood-hit people in Pulwama district of Kashmir. A Bench comprising Justices J Chelameswar and SA Bobde, however, said it was referring the petition to Chief Justice HL Dattu, whose Bench was hearing a batch of PILs for scaling up relief and rehabilitation work. “Since the CJI Bench would have an overall view of the situation” after hearing the PILs, it would be in a better position to consider the plea for avoiding the democratic exercise at this juncture, Justice Chelameswar said. On being told about the urgency involved in the petition, the Bench assured the party that the matter would be brought to the notice of the CJI today itself and further action was not within its powers. Nevertheless, the Bench remarked that it was difficult believe that the EC and government which were responsible for holding elections under the Constitution would not have assessed the ground reality before announcing the poll schedule. Arguing for the petitioner, senior advocate Rajeev Dhavan pleaded that it would not be appropriate to hold elections now as most voters were not in a position to take part in the exercise. People who had fled as many as 390 villages, which were submerged following the floods, were yet to return, while houses and other buildings in about 2,600 villages were destroyed. A total of 3.54 lakh structures in the state were damaged. Of the 12.5 million residents, 7.2 million were eligible to vote. The floods had affected eight million people, directly or indirectly, he said. The polling should be held only if every single voter was in a position to exercise his franchise, Dhavan pleaded. At this, the Bench wanted to know if it was possible to have a situation suitable for all the electorate. The NGO claims to be an advocacy civil society body in Kashmir with members from all walks of life. In order to advocate a holistic vision of development of the state, it has also demanded a high-level judicial probe into the causes of the floods. KCSDS’s chairperson Hameedah Nayeem and other functionaries of the organization said here today that the organisation had earlier represented to Prime Minister Narendra Modi against holding of elections in the prevailing conditions. Their stand is that a large number of persons have been displaced and they would not be in a position to take part in the election process. They alleged that relief and rehabilitation by the Centre and the state had been found lacking. They criticised the Centre for declining the offer of support to the flood victims by international agencies. Aviation regulator Directorate General of Civil Aviation (DGCA) has ordered an inquiry into the incident. A DGCA official said all airports had been alerted to look at the runway parameter security. “Last night a stray buffalo hit one of our aircraft on take-off roll at Surat airport. The buffalo was essentially invisible against a dark background,” a spokesperson for the airline said. The spokesperson said the services from Surat will be suspended indefinitely due to aircraft being grounded and to await results of investigation along with corrective measures that will be taken by the airport. The Boeing 737-800, flight no SG 622 from Surat to New Delhi was carrying 140 passengers and six crew. All are reported t be safe. “All passengers and crew were safe, however the aircraft was impacted quite severely and hence was grounded. An alternate aircraft was arranged by SpiceJet for the passengers who departed for New Delhi,” the spokesperson addded. “This is a serious incident in which there could have been many fatalities. The airports authority needs to secure the runway parameters by erecting walls or other methods,” said HS Khola, former chief of DGCA. Ahmedabad: The inquiry team is reported to have found that at several places the boundary wall and the barbed wire fencing of the airport separating the airstrip from the human habitation had collapsed through which any cattle, dogs or any another animals, or if so desired the human beings, could come right up to the runway without any check. A jackal strayed near the runway of Devi Ahilyabai Airport in Indore on Friday and was captured, a forest official said. “A jackal was trapped in one of the eight cages set up near the runway,” divisional forest officer AK Joshi said. The cages have been installed to trap the canine after around 20 jackals were spotted in the area, he said. “It is not within the domain of the Court to legislate…The courts are not to plunge into policy making by adding something to the policy by way of issuing a writ of mandamus,” the Bench, which included Justices FS Nariman and UU Lalit, held. The SC noted that at no point the Central Government had issued a notification to have a Census conducted on caste basis, barring the Scheduled Castes and Scheduled Tribes. The Census also covered details that would help in nation-building, trends of population, availability of requisite inputs for planning and fostering the welfare of the country. It was clear that the government had framed a policy covering many an arena keeping in view certain goals and objectives. The neurologists, who were here for a conference of the Indian Academy of Neurology (IAN) at Post-Graduate Institute of Medical Education and Research, pointed out that despite neurological disorders like stroke, migraine and epilepsy emerging as major public health issues in India, there was an acute shortage of the specialists. “India needs to increase its strength of neurologists to cope with disorders like stroke that are deadly. A strength of 1,200 neurologists for such a huge population is less and overburdens the existing ones,” said Dr Farah Mateen, Massachusetts General Hospital, US. “Patients here lack awareness about symptoms and precautions of epilepsy or seizures. Besides, patients here are not a part of decision making while developing drugs or standardising treatment patterns,” said Dr IM Sawhney, a professor of neurology at Wales, UK. Seven shadow Cabinet committees have been formed ahead of the winter session of Parliament beginning November 24 to keep a watch on decisions and policies of key ministries of the Narendra Modi government, a senior party leader said on Friday. Despite being reduced to just 44 members in the Lok Sabha, the Congress has utilised its pool of talent in Parliament to confront the government which will be enacting new laws and amending those passed by the erstwhile Congress-led government. Former ministers, including AK Antony, M Veerappa Moily, Anand Sharma, Oscar Fernandes as also Congress leader in the Lok Sabha Mallikarjun Kharge and Leader of the Opposition in the Rajya Sabha Ghulam Nabi Azad, are prominent members of these committees. The committee that will look into issues relating to finance, foreign affairs, commerce and information and broadcasting has Moily, Sharma and Jyotiraditya Scindia as members while the panel on home, defence and law and justice has Antony, Ashwani Kumar and IYC chief Rajiv Satav in it. Digvijaya Singh, Ashok Chavan and Ninong Erring will be part of the group which will focus on agriculture and drinking water and sanitation. Kharge is on the panel on railways and labour along with Fernandes and Ranjeeta Ranjan. The panel on health and women and child development has Azad alongwith J D Seelam and K Suresh. The committee on HRD, panchayati raj and northeastern region has Mani Shankar Aiyar, Bhalchandra Mungekar and Sushmita Dev as members. The panel comprising KV Thomas, Jairam Ramesh and Gaurav Gogoi would look after rural development and environment issues. The committees are loosely based on British parliament’s concept, where the opposition party appoints an MP to ‘shadow’ each of the members of the Council of Ministers. Navy Chief Admiral RK Dhowan, who is on a four-day visit to Seychelles till November 9, has cut short his visit and will arrive in the north coastal Andhra city. Navy authorities said the vessel sank at 8 pm on Thursday night while it was on a “routine” mission to recover practice torpedoes fired by fleet ships during a “routine” exercise. “The vessel experienced flooding in one of the compartments. One sailor has lost his life during the rescue operation and four personnel are reported missing. Twenty three personnel have been rescued safely by the Search and Rescue (SAR) ships dispatched to the area,” a statement said. At the time of incident, 28 personnel were on board. After receiving a distress call from the sinking vessel, several naval ships were sent out for rescue operation. This is the latest among a series of accident to hit the Indian Navy in the past one year. On October 31, INS Kora suffered minor damage after it was scraped by a merchant vessel near Visakhapatnam. TRV is an auxiliary vessel which is used to recover practice torpedoes fired by fleet ships and submarines. The ship is 23-metre long and 6.5 metre at the beam. A Bench headed by Chief Justice HL Dattu asked Solicitor General Ranjit Kumar to ensure that the government filed the affidavit by November 21, before the winter session of Parliament began on November 24. The apex court passed the order after being told by senior advocate Meenakshi Arora, who was assisting the Bench as amicus curiae in the suo motu PIL case, that some of the accommodation was under unauthorised occupation for long time. She said the affidavit filed by the government earlier did not provide necessary details. Not even the total number of bungalows under each category (Type 6, 7 and 8) was given. It was stated that there were 126 bungalows in category 7 and 185 in category 8. The number of accommodation in category 6 was not given. While the government was entitled to allot five per cent of the vacancies arising every year under the discretionary quota, the actual percentage of such quota was not disclosed. Some of the occupants were allowed to continue for want of suitable alternative accommodation to which they were entitled. People in such high positions could not plead that they could not afford anything other than government bungalows, she said. Many persons who were entitled to such accommodation were waiting for years because of the situation arising from unauthorised occupation, Arora told the court. Both the leaders also expressed their countries’ keenness in strengthening ties, with Netanyahu emphasising that he “believes that relations between the two countries were poised for rapid development” following his meeting with Indian Prime Minister Narendra Modi in September in New York. During that meeting, the Israeli Premier had said that “sky is the limit” in terms of prospects of cooperation between the two countries. Rajnath and Netanyahu discussed regional situation and the evolving threats to the global communities from terror. Rajnath said terror was a threat not only to countries like India and Israel but to the whole world. Vowing to strengthen India’s “very warm” relations with Israel, the Indian Home Minister, on his first bilateral visit to Israel, said, “India and Israel share very warm and cordial bilateral relations. We look forward to strengthen it further”. Fresh from his participation at Interpol General Assembly in Monaco, he said that he made a strong pitch for cooperation in the field of cyber security during his one-hour conversation with the Israeli Premier. He was earlier widely quoted in the press for highlighting the use of social media for indoctrination by Jihadi elements and the urgent need to device ways to curb this practice through the use of internet. “I met yesterday your Prime Minister and he himself is running the ‘third revolution’. The first was introduced by — I would call him a prophet — Mahatma Gandhi. Then Jawaharlal Nehru looked how to pave the ground for sustainable India. He did something which is unusual. Five-year plan from Russia and another from MIT. “Then came the Prime Minister (Modi) who has great experience and wisdom in India itself, and created a ‘third revolution’ combining the spirit of Gandhi and the pragmatism of Nehru. We should not give moral judgement yet, we can bring India to new heights,” Peres said. “The Recognition of New Systems of Medicine Bill 2014”, the draft law will, for the first time in the country’s history, pave the way for statutory systems to recognise evolving systems of medicine which are being practiced across the country without government approvals and stamp. Some of the systems that could get approval once the Bill is passed by Parliament are – electro homeopathy and bio-chemic medication and remedies. Sources in the government said the draft Bill is ready for presentation to the Cabinet after successful inter ministerial consultations and approvals from Ministry of Law. “The consultations are over. Comments have been received and there are no major objections to the Bill. It could be introduced in Parliament in Winter Session once the Cabinet approves it,” a source said. This is in stark contrast to past occasions when the state units of the Congress reacted with urgency to “put in place” all rebels who questioned the working of party vice-president Rahul Gandhi in Kerala and Rajasthan. The rebels in these states were suspended. But in case of Karti, the Congress is adopting a guarded stance and advocating a soft approach. "This is an internal matter of the party," said Congress spokesperson Salman Khurshid. Some leaders went to the extent of defending Karti, saying he was only speaking in context with the Tamil Nadu unit, where the party is currently at number four and is struggling for revival after the split engineered by GK Vasan, a former UPA Minister. “He meant the party unit in the state should have the freedom to take quick decisions and implement them. It was in that context that he said the practice of sending central observers to states ahead of decision making should be avoided," said a party leader.